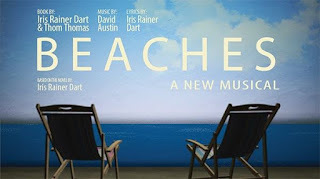 It is being reported from several sources that a musical adaptation of the 1988 Bette Midler film Beaches is expected to Play London's West End in 2019 before heading over to Broadway. Iris Rainer Dart, who wrote the novel of which the movie is based said: That would be the hope. I feel very lucky, first of all, to be my age (she is 74) and doing this. The theatre has much less ageism than the movie and television business. Lonny Price has signed on to direct the show with a book by Dart and Thom Thomas, and score by Dart and newcomer David Austin. The story takes place in Atlantic City, New Jersey, and is about two friends from different backgrounds who keep a long-lasting relationship after going their separate ways. Right now, the stage production is in the workshop stage, where the creative team is writing new songs and rewriting dialogue. We're just listening, refining, redoing and seeing which songs work and which ones don't, Dart explains. In 2014 and 2015, there were two productions of the musical in America. It played both Chicago's Drury Lane Theatre (starring Shoshana Bean and Whitney Bashor) and Virginia's Signature Theatre (starring Alysha Umphress and Mara Davi). Dart hopes to incorporate some of the talent from both incarnations. Lifetime recently remade the film for TV with Idina Menzel and Nia Long taking on the roles originated by Midler and Barbara Hershey.